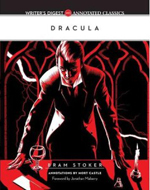 Inciting Event: Dracula’s otherworldly powers are revealed when Harker sees him crawling upside-down down the castle wall. First Plot Point: Dracula arrives in England, via the shipwreck. First Pinch Point: The stolen wolf Berserker breaks into Lucy’s room, frightens her mother to death, and allows Dracula to feast on Lucy once more. Midpoint: Lucy is revealed to be a vampire. Second Pinch Point: Renfield desperately warns Seward and Co. that there will be consequences if they don’t let him go. Third Plot Point: Dracula turns Mina into a vampire. Climax: Mina and the men set off for Transylvania in pursuit of Dracula. Climactic Moment: They kill Dracula. Resolution: The survivors live happily, and Mina and Harker name their child after the vampire hunting team. Dracula attempts to move from Transylvania to England so he may find new blood and spread his undead curse. What ensues is an epic battle between Dracula and a small group of men and women led by Professor Abraham Van Helsing.